For North Texas, things were looking grim in Iowa City. They'd fought evenly with Iowa, even catching a few breaks, but the Hawkeyes took the lead on a field goal. To make matters worse, starting quarterback Mason Fine was down with an apparent knee injury. Backup Quinn Shanbour came off the bench cold against a Power 5 team on the road. Not exactly ideal. Then Seth Littrell showed why he's the right man for the job, instead of playing conservative, Littrell went at the Hawkeyes with 33 seconds to play in the first half. First, he let Shanbour do what Shanbour is good at, running the ball. Then to hammer the point he let Shanbour throw a difficult out route, across the hashes. A personal foul by Iowa put the ball at the thirteen with eighteen seconds in the half. The broadcast team noted that North Texas was in field goal territory, Seth Littrell knew his team was in touchdown territory. Every good coach can envision the way things play out and what might work in certain situations from certain spots on the field. Littrell and Offensive Coordinator Graham Harrell dialed up just such a play on first and ten from Iowa's thirteen, a post corner to the field side. 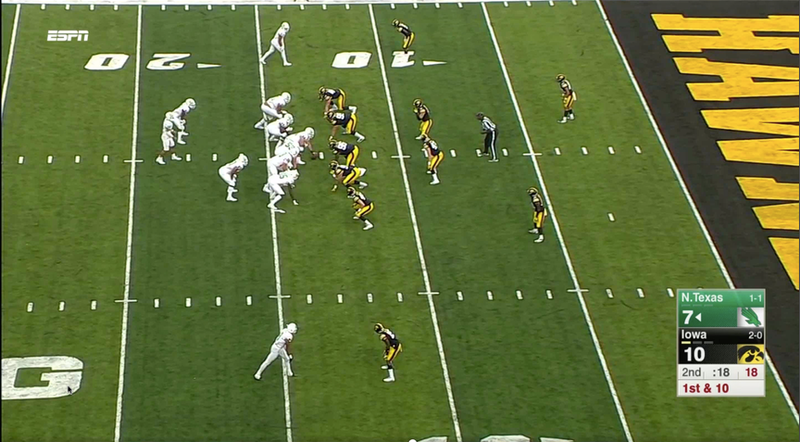 Iowa is playing Cover 2, skewing to a Cover 2 Red with the field condensed. The middle of the field is open, in other words, both safeties are high. North Texas is playing 12 personnel, two tight ends/one back. Iowa is running a classic 4-3 look, they have to account for Jeffery Wilson in the backfield. He's gashed them for one score already. Here's the play from stem to stern. Now the field or wide side cornerback watches Guyton take an inside release, that's what he wants, but his job is to protect the area outside the hash. Ideally he would run with Guyton on Guyton's inside release, then sink back to protect against the corner route. That's where the green grass is. Once Guyton gets outside leverage, North Texas has a winner. How Guyton get's outside leverage is the nuance. Guyton's outside leverage is the sum of several parts. 1st, the tight end occupies the field safety with a seam route, which works because 2nd, Shanbour's eyes move the safety to the boundary or short side of the field. And 3rd Guyton is a physical route runner. Once Shanbour pulls the safety, there is an abundance of green or rather black turf outside the hash. All Shanbour has to do is put the ball into the roughly 60 feet of green space. Notice that Shanbour throws the route perfectly just before the break and before Guyton gives him a target. Guyton gives him that option by running a great skinny corner. Guyton gets up on the corners shoe tops and once the cornerback turns his hips, from there it's man principles because the corner is on his own, the old Herm Edwards idea that the game comes down to your guy beating their guy one on one. Guyton uses a very nice armbar to turn the cornerback and undercut the route in the one area where the outside linebacker can't drop fast enough and where the corner can get back underneath. It's skinny because Guyton is less vertical off the undercut, he's running to the green grass and the ball. Beautiful. Posted on September 19, 2017 by The Roundup and filed under North Texas, Southwest Round-Up and tagged North Texas Iowa Seth Littrell Quinn Shanbour Jalen Guyton Mason Fine Jeffery Wilson Herm Edwards Graham Harrell Film Room.